Perhaps if the music thing doesn’t work out for Billy Bob, he can take up professional poker as his next gig. 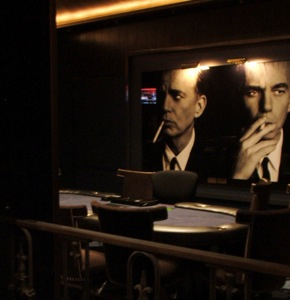 Billy Bob Thornton was spotted playing poker in the new Poker Lounge at the Hard Rock Hotel & Casino Thursday night. He was joined by friends and bandmates from The Boxmasters in the back room of the lounge that some are calling the Billy Bob Thornton room – an oversized image of the actor/musician hangs on the wall above the table. Thornton was back inside the Poker Lounge Friday morning signing the large picture of himself. Billy Bob Thornton and The Boxmasters performed yesterday night at The Joint. ALT CAP: Billy Bob Thornton doing his best Sammy Farha at the Hard Rock.